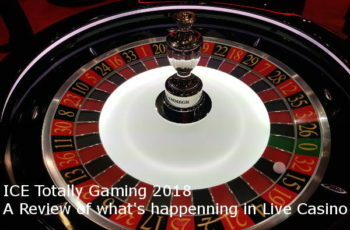 This is my review of what’s to come in Live Casino in 2018. 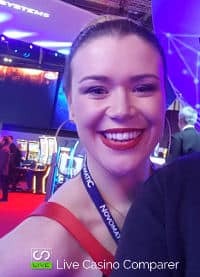 I spent an exhausting 2 full days at the ICE Totally Gaming Conference held between the 5-7th February 2018 in London. I visited all of the live casino operators, many who I’ve got to know well over the past few years. It’s great catching up with everyone and being able to talk with the experts about their products and trends for the future. I hope you enjoy my report and learn something new about what’s happening in Live Casino in 2018. What struck me initially was not just how big ICE has become, but how over the last few years Live Casino has really exploded. I already knew that, but you only really understand when you see all of the suppliers in one place, displaying thier wares and competing for new customers. There is a really strong competitiveness between them all. All want to be leaders in some form. But they also need to be followers, ensuring that they can also offer the same game or experience a customer is looking for. While most of the suppliers now have Mobile, the early adopters are still struggling to fully deploy HTML5. Most seem to be going through a transition stage of migrating away from Flash to full HTML 5 versions on their other platforms. If you play regularly you’ll be familiar with the browser refusing to load a game or a popup informing you to install flash. I’ll be pleased when that ceases to become a problem. 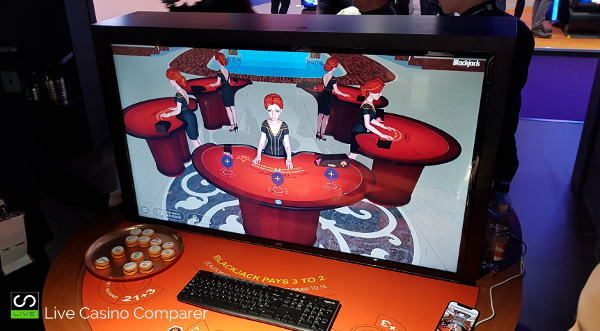 Innovation in Live Casino is in abundance at ICE this year. As is typical for this time of year, new products are launched and it was no different this year. New games from Evolution & Playtech. Netent launching their Live beyond Live Product with Mr Green. Another strong appearance from the Asian based operators. Vivo and their floating Roulette. New studio launches across the world by a lot of the suppliers. Entry into new licensed markets. A complete platform refresh by Ezugi. The launch of a customer facing brand by Portomaso Gaming. I think of all the innovations I was blown away by Ezugi’s new Virtual Reality solution. You join a table in a real land based casino, stand beside the players, place your bets on the table and can watch the wheel in close up. It’s as near to real as it can get. There are a few practical things that need to be ironed out, but I was mighty impressed. Someone commented to me that they felt like a ghost, floating beside the table!. I didn’t feel that as I was too immersed in the experience. Would I play the table like this sat at home in my front room? Probably not, but it will definitely appeal to someone. The numbers of people taking this up will determine whether it becomes a success. So kicking off my roundup is Evolution who probably had the most new products to shout about. Evolution had the biggest Live Casino stand of them all. Plenty of large screens with video on loop of all the new games. Inside the inner rooms you could play in demo mode all of the games. I spent a while having a good play and recording some of the action. The new Lightning Roulette, presented in a very similar fashion to Dream Catcher. It’s normal European roulette, played with an Auto Roulette wheel, but the game comes with additional side bets and multipliers. The presenter does a good job in moving the game along and great presentation, lightning bolts and lighting really add to the experience. No Commission Baccarat pays 1:1 on dealer wins rather than 0.95:1. It’s a game Evolution has been lacking. Now they can complete with Playtech at least. Dragon/Tiger is another new release. Again something that Playtech and some of the other providers have had for a while. They styling is very good, with the Dragon or Tiger lighting up with each win. The Salon Prive got its debut and was launched soon after at Unibet and Leo Vegas. High Rollers can play on Blackjack and Roulette tables on their own. No-one can watch and they control the dealer, shuffles and bet times. It’s great to see this facility added. Hopefully there are enough big players to ensure a good ROI. RNG Roulette is a departure from what Evo normally does. I’ve still no idea why they’ve done this. Quite frankly is horrid. I don’t think it fits with Live Casino, there are many better products out there. Grosvenor Dual Baccarat – This wasn’t really being pushed but I found it in the lobby and had look. It’s obviously in Beta at the moment and not yet available at Grosvenor Live Casino. The camera is positioned overhead so you can’t see the people in the casino placing their bets. Outside of the show we saw the opening of the new Canadian Live Casino Studio in British Columbia, Canada. Only Canadian players in that area will be able to play at these tables. There’s more to come from Evolution but as always they keep their cards close to their chest. Playtech were displaying a new game, Spin and Win. It looks like a clone of Evolution Dream Catcher. Unfortunately no-one from Playtech was available to talk to me. I had a really nice chat with one of the dealers on the stand. A young Australian presenter called Rosie, who does a whole load of interesting stuff when she’s not dealing at the tables. I’ll be sharing some more info in an exclusive interview in a few weeks time. I got a tour around the new 360 Virtual Realty system. It’s still in development but from what I’ve seen it’s an interesting concept. It goes one step further than NetEnts Live beyond Live, because you actually get to walk around the virtual lobby and studio and can then join any of the existing tables. It’s really interesting seeing these innovations, but does make me wonder who will use them? No new games are being planned, but expect to see a closer integration with Novomatic/Greentube. More land based streaming is being added with tables from Croatia (Zagreb), Gibraltar (Admiral) and Spain (San Roc). We’re also going to see more innovation using the Leader board technology. Extreme has the three E’s, Expert Dealers, Extraordinary Technology and Extra Personal Service. The big news at the NeEnt stand was the launch of the Live beyond Live product in association with MR Green. You can read a more in depth review here. Suffice to say that NetEnt is finally waking up that their Live Casino product is not really competing. They are in the process of taking a good hard look at what they are doing. Blackjack will be getting Side bets and in another 12 months we may see a new game added. Personally I hope they steer away from Baccarat and go for a poker or different type of Roulette game. The desktop version is next for a revamp in HTML5 so we may see some improvements with the playing interface. 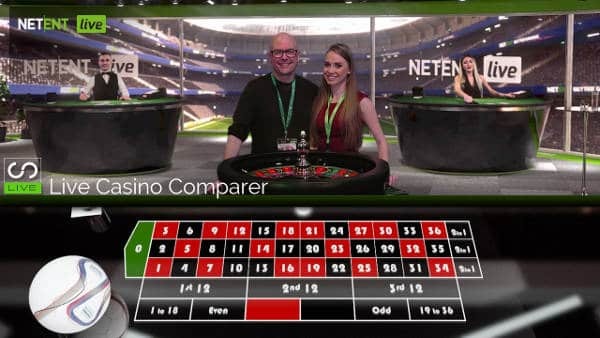 I had a bit of fun on the NetEnt stand again, trying my hand at Roulette. I only managed to lose the ball twice – I must be getting better! Vivo Gaming doesn’t have a presence in the UK, however they are strong the Latin, CIS and Turkish Markets. Apparently a UK license is in the plans, but that’s been the case for the last 3 years, so I won’t be holding my breath. The good news is that a license application is currently going through in Malta and plans are being made to enter the Spanish market. New studios are on the way in Uruguay, Eastern Europe and a specific studio for the Turkish market. In terms of games, Vivo has recently launched Floating Roulette on Mobile. It’s possible to move and resize the video image on the screen during game play. Ezugi is another operator that has made a substantial move in the live casino market over the past 18 months. All but one of their studios has had a makeover and new studios have been opened to support an increasing business. 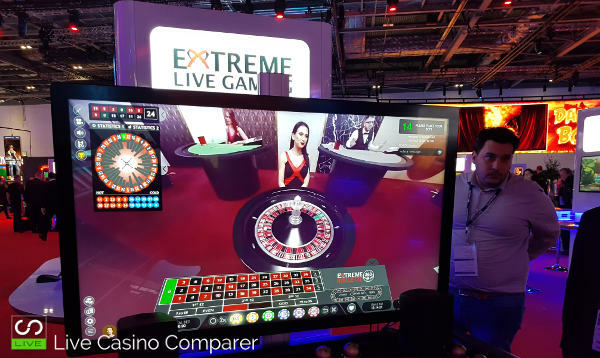 Strategic partnerships are also evident, with land Based streaming from Portomaso Gaming being offered as well as streaming from the Queenco Casino in Cambodia. I also found out that Ezugi was responsible for the build of the new Entasia Studio in Latvia. Expect to see the lobbies and the playing interface all change shortly. Everything has been rebuilt from scratch. The Virtual Reality product, as I mentioned earlier, is a real head turner. 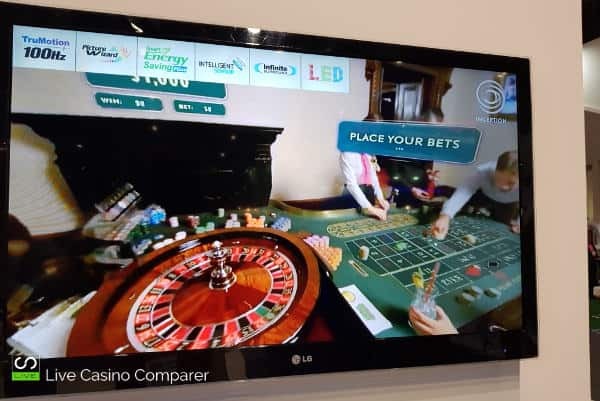 The solution is streamed from the Palace Casino in Romania and is ready to go, with a number of licensees apparently lining up to be the first to use it. Regulated markets are now a key business growth area for Ezugi. A UK License is almost there, Yay! !, with licenses in Italy, Denmark, Malta, Span, Switzerland and Sweden on the way. Sic-bo has had a face lift, with a new machine being installed immediately after the conference. I also go to chat with Stephen Au-Yeung the inventor of Ezugi’s latest new game, Unlimited Blackjack with Auto Splits. 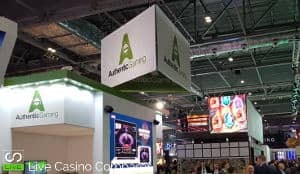 The guys at Authentic Gaming were in a buoyant mood having announced that morning a strategic partnership with Playtech, to provide them with land based streamed roulette. I’m still impressed that they’ll be opening a table shortly from Foxwoods Casino in the USA. This is a major coup and one I’m very much looking forward to seeing and playing. Portomaso Gaming had quite a large stand, which was being taken apart as I arrived to fix a fun to play wheel of fortune. I had a quick chat following on from my visit to the studio in November. 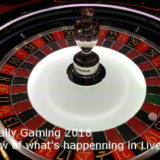 The new Roulette table from the Oracle his now being streamed and their B2C website, betfashion.TV is now online, which showcases the live casino products they have to offer. BetGames are not your normal run of the mill Live Casino provider, but they do have some really great games. Their games are big in Europe/CIS and African markets. I had a nice chat with some of the presenters and managed to get my picture taken with them. They were one supplier that had really softened their approach from last year, doing away with bikini clad women choosing instead to rely on the strength of their games to attract customers. So left to right we have Gabriele Slapokaite, Karolina Ignataviciute & Izabela Vilkaite. I didn’t spend as much time as I would have liked with the Asian suppliers. They were out in force again, demonstrating their products and they all seemed very busy. Thankfully the organisers had located them all in the North Hall. Asia Gaming Brief, Asia Live Tech, Ho Gaming, N2-Live, SA Gaming and Allbet were all in attendance, as were a few more that I missed. I finally got to understand the relationship between Amaya/Ho Gaming. I can report that Ho Gaming is very much in operation and I’ll be updating my review of their games when I’ve had a chance. Yggdrasil are not a live casino provider, but I’ll mention them because they were showcasing a new product. It’s an RNG Blackjack game, but very much in the mold of Live Dealer. You have a dealer behind the table, you take a seat and cards are dealt to you. It was quite impressive as RNG games go. There was a lot of interest in it, more so than the RNG roulette released by Evolution. I managed to win a total of 2 hands out of about 20 I played over two visits. I’m not sure whether the game was configured like that for the conference, but if that’s any indication of what it will be like I certainly won’t be going back any time soon. Virtual Reality, Land based Streaming, new games and studios in new regulated markets seem to be the ongoing theme. Expect more of the same during 2018. I think we’ll continue to see innovation and some existing suppliers enter the UK market. Roll on the rest of the year. Most of the suppliers discussed here are represented in my list of Best Live Casinos. Here you’ll find a selection of great casinos.